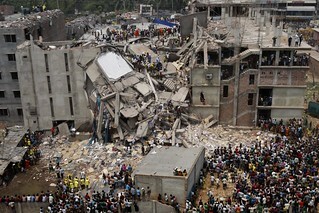 Just over a year ago, management at a garment factory in Dhaka, Bangladesh ordered employees to report for work, despite warnings of critical structural problems in the building. During the morning rush hour, the eight-story Rana Plaza building collapsed, killing 1,100 workers and injuring thousands more. 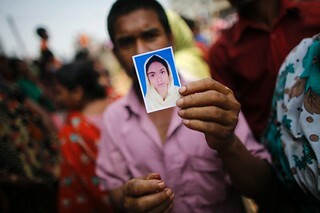 The Bangladeshi government vowed reformative action. American manufacturers proclaimed their commitment to ensuring the safety of factories where their goods were being produced. But what has really changed? The Accord on Fire and Building Safety: Introduced last May, this agreement is signed by trade unions, retailers and clothing brands, with the goal of identifying and resolving fire, electrical and structural risks at factories that produce garments for Accord members. By signing the agreement, brands and retailers commit to maintain their business level if inspections uncover dangerous working conditions, negotiate terms that will allow factory owners to comply with remediation requirements, pay the workers affected by a factory shut-down and withdraw their business from factories that refuse to comply with remediation recommendations. Of the 250 inspections conducted as of April 30, eight were found to have critical structural problems and temporarily shut. Another initiative, the Alliance for Bangladesh Worker Safety, includes 26 American and Canadian companies. The group’s inspections have been criticized for not being as stringent. All told, the inspections will involve about 2,000 of the country’s 5,000 garment factories that produce exports. The conditions in the remaining 3,000 buildings, however, are said to be worse. Sustainability Compact of Bangladesh: Last July, the European Union, International Labor Organization (ILO) and governments of Bangladesh and the United States adopted the Sustainability Compact, which aims to improve working standards and building safety. Labor law amendments: Also in July 2013, the Bangladeshi government revised its Labor Act, strengthening workers’ right to unionize. According to the ILO, the Bangladeshi government has allowed more than 140 labor unions to register since January 2013, compared to just two in the previous three years, and allowed an influential labor rights NGO, which had been stripped of its registration, to re-register. A release from the U.S. State Department, issued on the anniversary of the collapse, notes that union organizers still face intimidation and retaliation for their efforts. Rana Plaza Coordination Committee: Last September, the Bangladeshi government, United Nations, clothing retailers and labor groups created this committee to compensate victims and their families. But according to the New York Times, factory owners and retailers have failed to provide their portion of the $40 million needed, and few victims have received compensation. Increased wages: According to the ILO, based on its recommendations the minimum wage for garment workers in Bangladesh has increased 77 percent since the disaster.